Innovative solution for automated reaction preparation, microwave synthesis, work up, and analysis for Organic, Porous Material, MOF Libraries. 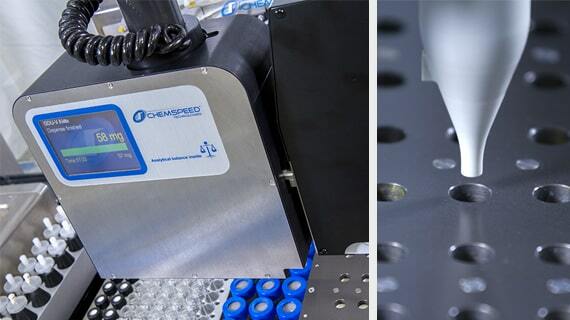 The ISYNTH SWAVE enables high-throughput synthesis with Chemspeed’s exchangeable robotic tools for liquid handling, solid dispensing,capping, de-capping, crimping and gripping, combined with Biotage microwave technology. Decrease in cost per experiment up to 90+ %. Increase in productivity by a factor of 10+. High-throughput microwave assisted synthesis and treatment. Microwave synthesis technology (batch and continuous). Reagent preparation to capping/crimping/gripping, multi-step synthesis, work-up, online transfer and analytics. 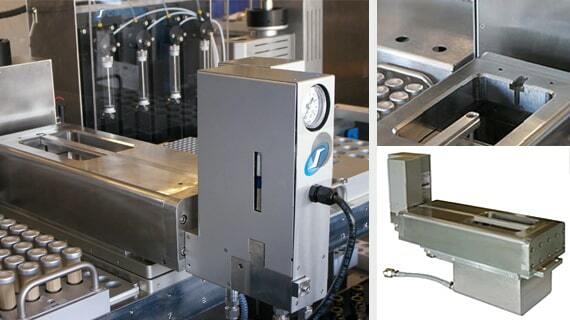 4-Needle Head for volumetric liquid handling and sampling. 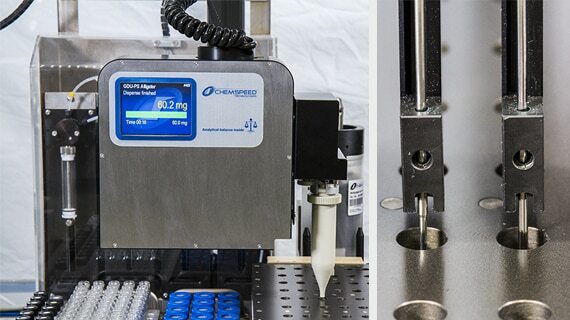 Gravimetric solid dispensing into an unlimited choice of vial / plate / reactor formats. The balance moves to the destination, increasing speed and efficiency. Balance resolution of 100 µg, or 10 µg. A large dispensing range, from a few mg up to several grams. 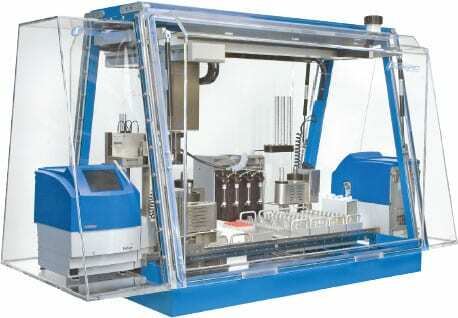 Powder dispensing / dosing robotic tool can be combined with other tools to accommodate multiple workflows. Dispensed amount, mixing speed, temperature, pressure, time…, and other data are stored in a read only log file. Easy access to data with a convenient interface to pull results into Excel or virtually any other software. Enhance your Efficiency and Productivity with our Workflow Solutions! Chemspeed’s ISYNTH SWAVE deck modularity allows the user to execute and perform a variety of microwave-assisted workflows in a fully automated fashion. 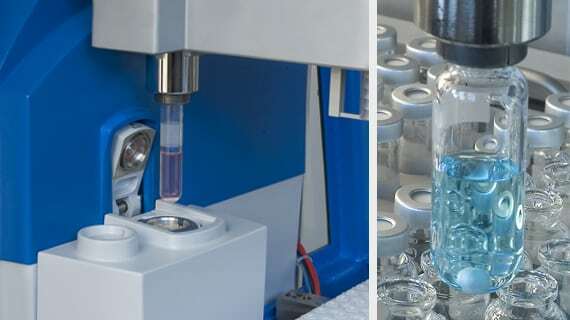 dispensing of solid and liquid reagents and solvents under inert atmosphere. work-up and purification of reaction mixtures. use of batch and continuous-flow microwave reactor within one protocol. Single mode microwave system with uniform heat distribution, and accurate temperature and pressure control. Access to large database of established methods for microwave synthesis (more than 3’600 methods). Minimum volume of 0.2 mL convenient for screening tests. Maximum volume of 20 mL allowing gram-scale synthesis. Reaction vial individually equipped with a magnetic bar for efficient mixing. Access to the crimped vial directly in the microwave cavity for automated reagent addition or for intermediate sampling. Solid-phase extraction on standard SPE cartridges. Sampling for online analytics (e.g. GC or HPLC) or kinetics measurement. 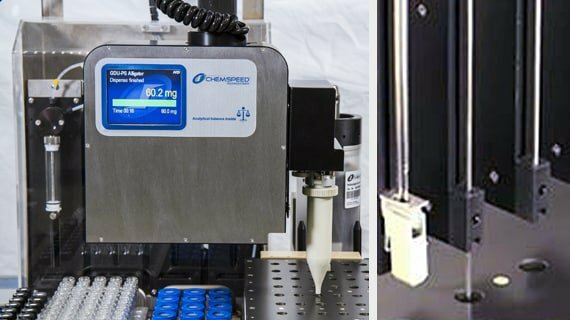 The Gravimetric Dispensing Units (SWILE, GDU-P fd and GDU-P models) are used to perform automated, gravimetrically controlled dispenses of a wide range of solids and powders in the milligram to multigram scale. The modules pick the appropriate chosen container, dispense the solids and powders, and then place the container back to its station before picking the next one. 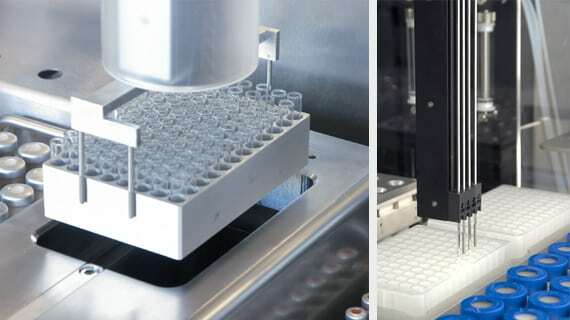 Both dispensing units include an overhead balance, and allow dispensing and simultaneous weighing of solids and powders into various vials, reactors, well-plates.